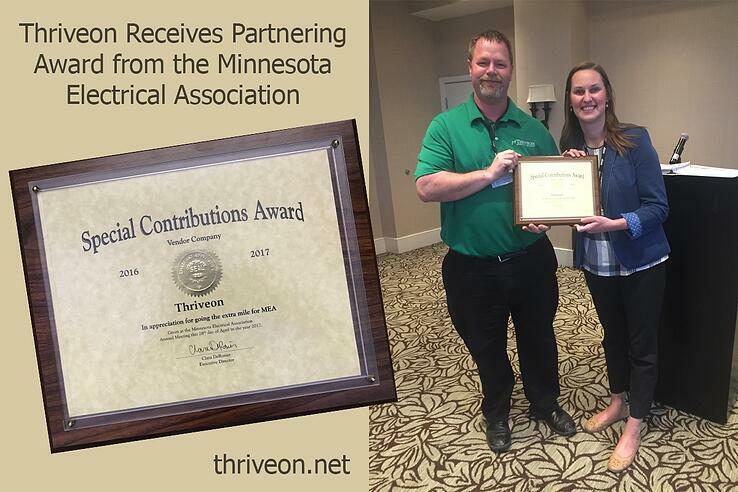 Minneapolis, MN 5/2/2017/2016 – The Minnesota Electrical Association (MEA) presented Thriveon with a Partnering Award at their annual business conference that took place on April 28th, 2017. This award recognizes an organization that has made a significant contribution to MEA’s success in the past year. Brian Spangler, Network Administrator for Thriveon, accepted the award from MEA Executive Director, Clara DeRosier, on behalf of the company and attended the banquet with his wife, Kristie. Since early 2016 Thriveon has partnered with MEA to provide business level IT guidance and outsourced IT department services that has resulted in outcomes that include: increased productivity, lower costs, better IT decisions and a hassle-free IT experience for their staff. Steve Bloedow, Thriveon President and vCIO (virtual Chief Information Officer) works closely with Clara DeRosier to learn about business objectives and identify technology initiatives that will support them.